THIS REVIEW OF ‘INCREDIBLES 2’ CONTAINS MINOR SPOILERS. By Jarrod Jones. 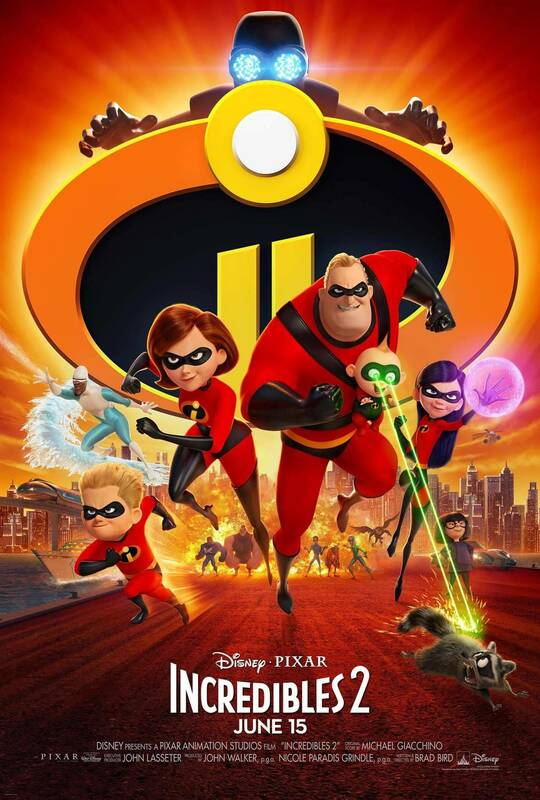 There’s been much clucking over the amount of time between The Incredibles (2004) and Incredibles 2 (2018), a lot of it dedicated to the question, “Is this sequel worth the wait?” The answer is probably not — though your mileage may vary when it comes to sequels that jam every working element of its successful predecessor into a bottle and hope the lightning will come pouring in soon after. It pleases me in no way to say this, but Incredibles 2 is sub-par Pixar. It sits on the shelf right next to Monsters University and Finding Dory which, again, will only be a detriment depending on how much you give a rip about anything other than having a good time. So is Incredibles 2 a good time? Sure, in an idle sort of way. The next-level veneer that has made Pixar the gold standard in computer animated films is slick and innovative as ever. But what separates Cars 2 from, say, Toy Story 3 is the level of love that gets poured into the story, and Incredibles 2 instead feels, oddly enough, compulsory. Don’t get me wrong: this isn’t some Illumination-level chicanery here; Brad Bird is still too good a filmmaker for that kind of balderdash. Which is why it’s surprising that his follow-up leans so heavily on the original. It operates in the same “divide then unite” paradigm as The Incredibles, only this time the film — which takes place the exact minute the last film ended (and ((fun fact!)) makes its 2005 video game follow-up, The Rise of the Underminer, obsolete) — flips the script by having Helen Parr (Holly Hunter) become the action-heavy focus of the film, while her husband, Bob (Craig T. Nelson), is left with the kids at home, fumbling his way to becoming a better father. Incredibles 2 resets some of the character work done in the original to brew a little bile in Bob once he finds out that über-corp DEVTECH wants to champion the return of “supers” with Elastigirl as the friendly face to their cause. (She’s the safest play, Bob Odenkirk’s CEO Winston Deavor says early on). As a result Elastigirl, a visual fusion of Judy Jetson and Emma Peel, has the most fun in this movie while Bob wears himself out chasing around baby Jack-Jack, whose own power set grows more diverse (and destructive) by the day. Back to Helen. It’s pretty clear something stinks within DEVTECH from the get-go, though the big villain reveal turns out to be even more brazenly obvious than the movie probably meant it to be. The villain, who hypnotizes people through television screens and is called “The Screenslaver”, has zero emotional connection to the overall film, which saps a lot of crucial energy from the war of ideologies between the villain and our hero. Their ambitions are to stomp out the possibility of supers being legally reinstated, which is all well and good, but there’s no personal grudge against Elastigirl (who is frequently pared off against the baddie) or the Parr family, or anyone with a name we’d remember once the credits roll. Even when Incredibles 2 works, and those moments are there, it shows how half-hearted the rest of this sequel is. That’s a shame, because Incredibles 2 thinks it has fascinating things to say about government legislation and how it often hinders progress more than encourages it, and one of the better things I found in this film was how the easy chemistry between Elastigirl and new character Evelyn Deavor (Catherine Keener) worked. There’s a pro-feminism angle that gets explored, only nominally. Like every other good idea here, the “Elastigirl is the focus” premise rattles inside this monolithic — but no less empty — sequel. A few sparks of life aside (there’s an especially hilarious bit with a hostile raccoon about halfway through), this tepid follow-up feels beneath director/writer Brad Bird. He clearly still has affection for these characters, but Incredibles 2 ends up feeling more obligatory than it should, an odd thing considering the — gah! — fourteen years that have occurred between installments. (Between this and Tomorrowland I dunno if Bird is going through a slump, but something’s gotta give.) “You are my greatest adventure,” Bob Parr told his family all those years ago. Now if only we didn’t have to watch this guy come to the same conclusion twice. Produced by John Walker and Nicole Paradis Grindle. Starring Craig T. Nelson, Holly Hunter, Sarah Vowell, Huck Milner, Bob Odenkirk, Catherine Keener, and Samuel L. Jackson. Rated PG for mild violence and a bit of drinking.